The old song goes: I'm dreaming of a white Christmas… But just how far would you go to get one? 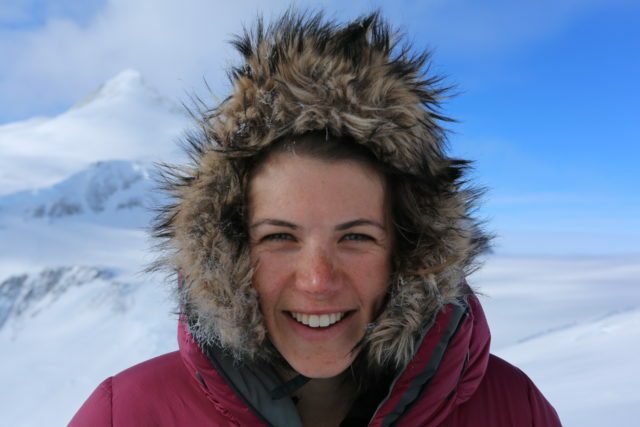 MLC Collegian Lydia Litton (nee Etherington, 2000) exemplifies the School's motto, Per Ardua ad Alta, and spent four weeks on honeymoon in Antarctica with her husband, Ed, striving for the heights; 4895 metres to be exact. Lydia Litton denies being an adventure junkie. Antarctica was just one of those places she had on her travel wish-list so when she got married, she and her husband, Ed, decided it was the perfect honeymoon destination. "I got married in December 2011, but we didn't have a honeymoon then as I was unable to take time off from my law studies to travel for the time period we want to," Lydia said. Neither Lydia nor Ed had any experience living in such an extreme climate. Both feared heights and neither had any mountaineering experience. "It all seemed a little bit radical. There we were, embarking on a four-week adventure in Antarctica hoping to climb Mount Vinson, the highest peak on the continent," she said. The Littons did not go it alone, however. They were trained and accompanied by experts who take tourists to Antarctica. Their adventure started even before they took off from Australia for their icy destination. "I accessed the continent by flying in on a Russian cargo jet, landing on a blue ice runway," Lydia said. "Once on the ground we started a two-week course in Antarctica to equip us with the skills required to climb Mount Vinson and also prepare us for the conditions we would encounter on the mountain. "During this time we mainly stayed in clamshell tents, basing ourselves at Union Glacier to acclimatise to the environment. I never felt uncomfortable or cramped however, it did get a little chilly at times." The Littons explored some of the nearby peaks in the Heritage Range of the Ellsworth Mountains surrounding Union Glacier, gradually adding in slightly more technical manoeuvres as our skills improved. They learned how to pull sleds, carry heavier packs and climb using a fixed line. They even had to leave the relative comfort of the camp at Union Glacier to practice their snow camping skills for several nights and climb peaks that may never before have seen a human footprint. Finally, they were ready for their accent of Mt Vinson. "The Mount Vinson adventure started with a flight in a Twin Otter airplane to the higher Sentinel Range of the Ellsworth Mountains," Lydia said. "We landed at Vinson Base Camp, perched at 2100m on the Branscomb Glacier. Over the next seven days we travelled up the mountain with our guide and rangers. "The mountain and environment speak for themselves. On Christmas Eve we stood on the summit of Mount Vinson."